Daffodils, those bright yellow trumpeters of spring bring one of the first splashes of color to our gardens. Did we say yellow? While yellow is by far the most common color, they also come in other colors and combination's of colors. 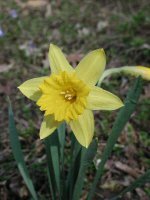 There are over 25,000 cultivars recognized by the American Daffodil Society. They are divided into thirteen different types with the most common type being the trumpet type with one flower per stem. While yellow is the most common color, these beautiful flowers can also be white, pink deep yellow to orange and many combination's of these colors. The height of flower and shapes of the trumpet or cup are two of the major factors used in distinguishing between the different types. There are also daffodils with more than one flower per scape as well as daffodils with doubled petals. Daffodil is the common name for flowers of the genus Narcissus and the two names are synonymous. In some parts of the country, yellow varieties are sometimes incorrectly called jonquils. They aren't fussy plants. Once you have planted them they will provide many tears of enjoyment, needing only a dressing of low nitrogen fertilizer in the spring and fall. We use a 3-5-3 formulation on our bulbs. Stay away from high nitrogen fertilizers. Like with most plants a lot of nitrogen will result in beautiful green stalks, but few flowers. They are pretty easy to plant also. Like any planting that will be there for a long time, it's best to do a little planning first. Planting them in groups will intensify the colors and make a bold statement. The main thing to remember is that the leaves need to remain for at least six weeks after flowering to replenish the bulb's food supply for next year. When the leaves start to turn yellow, it's OK to cut them back or dig up the bulbs if you wish. Last year we planted our daffodils surrounding an island that we had just built. The problem we ran into was that we had to wait until thy died back to do any edging of the island. We also inter-mixed sizes and bloom times so it was kind of a hodge-podge of flowers with no real structure. Sooo, this year we will be tagging the bulbs when they bloom and re-planting them where they can still be beautiful, but not in the way of what needs to be done in June to spruce up the yard. 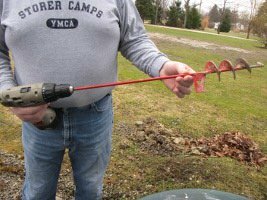 We like to use an augur bit attached to a cordless drill for planting our bulbs. These are commonly available and do a pretty good job of creating neat holes about six inches deep. The general rule of thumb for the planting depth of bulbs is three times the height of the bulb. Another method is to dig up an area and arrange the bulbs in a pattern depending on size or color. However you wish to arrange them, be sure that the pointed end of the bulb is up. Adding some compost never hurts as well as a bit of bone meal. However you wish to arrange them, be sure that the pointed end of the bulb is up. The best time for planting most spring flowering bulbs is in the early fall. Squirrels or mice will not eat them but we have had some problems with squirrels being curious and digging them up. For this reason, if you plant an area you should cover it with chicken wire secured with stakes or wire staples for the first winter. When selecting bulbs only use those that are firm with no soft spots or discolorations as this may be a sign of "basal rot" or fusarium fungus. There are several reasons that the bulbs stop flowering. Some cultivars are more sensitive to transplanting than others and may not bloom the first year. The growing conditions in the previous spring may have been less than ideal. The bulbs haven't been fed regularly or were fed with a high nitrogen fertilizer. If the leaves are cut too early it will affect the bulbs for next year. Also, the bulbs will divide every year or so. If they have been growing in the same area for several years they may become crowded and stop blooming. Daffodils should also be planted so that they receive at least a half day of sun. For all that, they are still very hardy plants. Down the road from us is a vacant lot. Every spring, there is a large patch of daffodils growing there without care for at least the thirty years we have lived here. Every year, the first flower to bloom in our yard is one that we never planted, a solitary specimen that grows by itself year in and year out. We have some other bulbs that were here when we moved in. They are in almost complete shade and send up leaves faithfully each year. Last year was the first time in memory that they produced a blossom. Daffodils are not without problems. In addition to the basal rot mentioned before, they are also susceptible to viruses such as yellow stripe which appears on the leaves, and mosaic which appears on the flowers. Animals will not eat them, however, so they are good choices where rabbit and deer pressure is great.